Every single country has a favourite spot which attracts visitors for various reasons, Ibiza for example or Miami beach, Phuket, New York are known to be extremely famous tourist destinations. On a Mauritian scale, one of the most appealing tourist destinations is Grand Bay. Situated along the northern coast line which recedes to give way to a majestic bay, Grand Bay is a hot spot on the island. During the day, the welcoming turquoise waters which shimmer glamourously under the sun rays is probably a big detonator to its popularity along with promises of shopping, the warmth of the people and area itself pervaded with bars and cafés situated on the waterfront. At night, Grand Bay turns into a rare clubbing spot on the island. If you wish to tantalise your taste buds, maybe bust a move or two, shop till you drop or hit the sea for some water fun – Grand Bay will definitely amaze you! The shopping experience in Grand Bay is very interesting to people who are used to orderly malls with information booths and hundreds of shops to choose from. Here the atmosphere is relaxed. Hawkers will be found on the beach, streets and markets. For your classic malls and boulevards, make your way to Sunset Boulevard, GBS plaza or Super U for branded products and duty free shops. However, if you want to embrace the vibrancy of Grand Bay, a visit to the fisherman stalls and Grand Bay Bazaar is a must. The freshly fished octopus and colourful fish being sold are nice to look at while the haggling and shouting of the fisherman adds to the zest of the place! 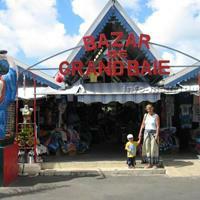 For a real bazaar atmosphere head to Grand Bay Bazaar. On your way there, you can find plenty of shops on the right and left side of the road, which sell mostly souvenirs or clothes. The big gates of the bazaar are impressive and you will be welcomed by two giant Buddha’s. Vendors will try to lure you into their shops and you need to bargain to bring prices down although the items sold are not particularly expensive. Some stalls offer colourful bags, fabrics and handicrafts while others sell beautiful stones, silver and golden jewellery. In front of the Grand Bay Bazaar you can still your hunger at a snack stand. Shopping for Gifts: What unique gift items can you purchase to bring back? Everyone knows that bringing back souvenirs can be quite time consuming! Surprise your family and friends with some really exotic buys like rattan handbags woven by hand. For a taste of Mauritius, you can tease their taste buds with local spices, achards and pickles, flavoured tea (vanilla, mint, elaiti (cardamom) and lemon), freshly ground coffee and vanilla sticks. For those of you who appreciate the delicate art of ship models, many of our craftsmen have specialised in replicating historical ships to give you a piece of our maritime history. o Polish on your bargaining skills - you never know how much you can save! o Make sure your local immigration allows entry of fresh and/or dried food, souvenir products made of wood, dried materials and other ethnic products. o Have a local you can trust with you and see the difference it makes! o Carry water with you to keep yourself hydrated. o Wear flat shoes to be most comfortable. 1. L 57 - Such a dreamy setting for a relaxed and chilled out night full of picture perfect moments (263 6357). 2. Takamaka Bar & Night Club – One of the most happening clubs on the island. The bar staff is particularly friendly and out there to assist you quench your thirst! 3. La Villa Bar – Chic bar with a good ambience is what you should expect. Contact them to find out more about their weekly events. 4. Beach House Restaurant & Bar – Great location! Right on the waterfront, the Beach House Club is an all-time favourite venue by day and night. 5. Cocoloko – The food, the drinks, the atmosphere. Cocoloko has it all. To find out more, check our listings in our Eating Out Section.